CRYOLIB toolkit is specially designed to simulate cryogenic installations and their control systems. It is based on a library originally developed at the European Organization for Nuclear Research (CERN) and was validated with experimental data from CERN installations. A complete database of fluid properties is offered with the toolkit: He, N2 , Xe, Ar , O2, etc. The fluid properties are calculated interpolating in tables for speeding up the simulation. The tables of fluid properties were generated using REFPROP software package except for the Helium which properties were generated using HEPAK. System design and integration studies of this system in the whole plant. Develop/optimize/test control algorithms or perform virtual commissioning tasks. 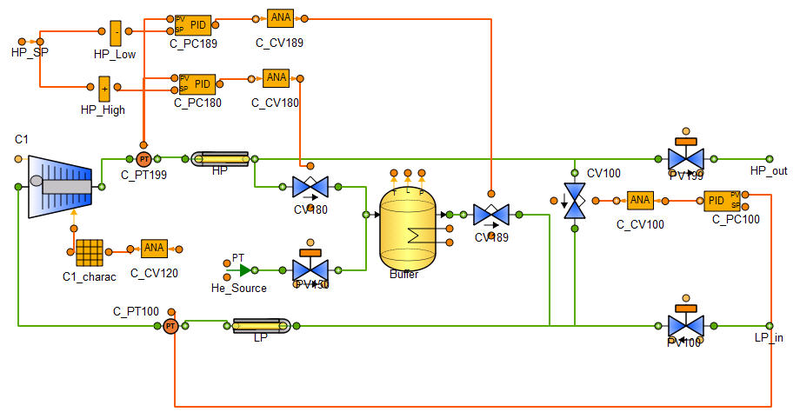 Develop a full system simulator, including all cryogenic loops and cryoplant, for operation support, making particular use of existing cosimulation techniques. 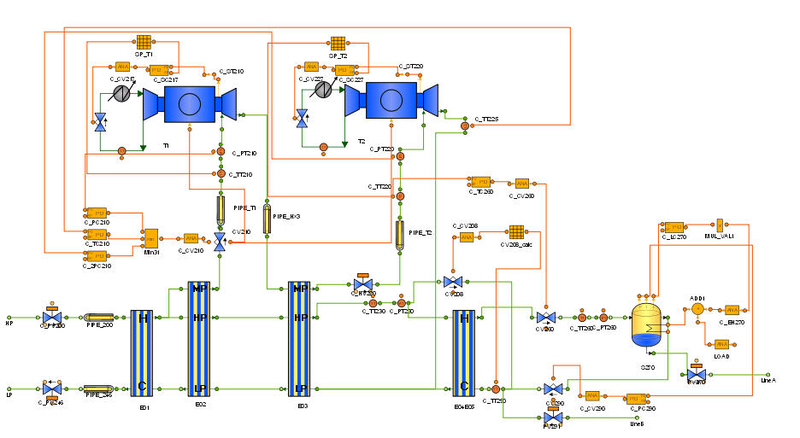 This user case simulates the cooldown of a small refrigerator with its control system. The refrigerator consists of a compression station where the coolant, in this case Helium, is compressed at ambient temperature and a coldbox where the helium is cooled due to expansion when it goes through the system of turbines. The compressor station and the coldbox are connected by an HP line and an LP line that are modelled as two pipes. The compressor station is composed of the following elements: compressor, buffer, high pressure (HP) and low pressure (LP) lines, controlled gas valves and PIDs and auxiliary elements of the control system. The HP control system acts on the valves at both sides of the gas tank to regulate the level of gas inside. In order to avoid instabilities of the system around the set point, PIDs are set with a 0.15 difference with respect to the set point HP_SP. The system thus keeps in a range of +/-0.15 without causing oscillations in the system. The PID of the LP line opens and closes the by-pass valve to regulate and keep the pressure at around 1 bar. Compressor actuation is regulated by means of the slide valve. The coldbox is made up of four heat exchangers connected to two turbines and a phase separator, where we will obtain liquid helium. The control system of the coldbox is designed to keep pressure at the inlet of the turbines at a certain values as well as to regulate the temperature of the fluid at the outlet of the turbine near the cold end. 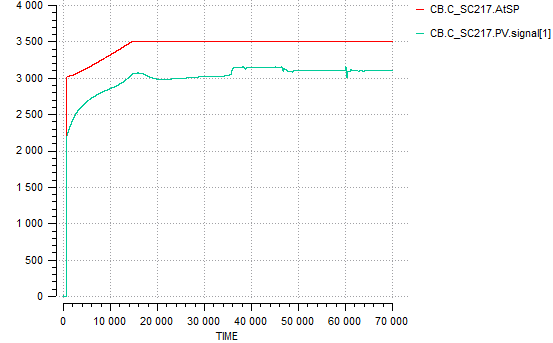 The experiment simulates the cooldown from 300K to 4.5K in 70000s. The compressor station (CS) starts working at time equal to 100 seconds. At time t=300 seconds the HP line of the compressor station is connected to the HP line of the coldbox and then the same for the LP line. At the same time, PC290, TC260 and LC270 start to regulate the coldbox. At time t=500 seconds the compressor is set to full power and 100 seconds later the turbines are turned on. The system begins to freeze, and after around 38000 seconds (10 hours of cooldown in the real system) there will be liquid helium inside the phase separator. At time t=45000 the buffer is filled. Cooldown continues until 70000 seconds, at which time the temperature reached at the outlet of the phase separator is 4.5K. In the picture below we can observe the evolution of temperatures at the outlet of all the heat exchangers and also at the phase separator. 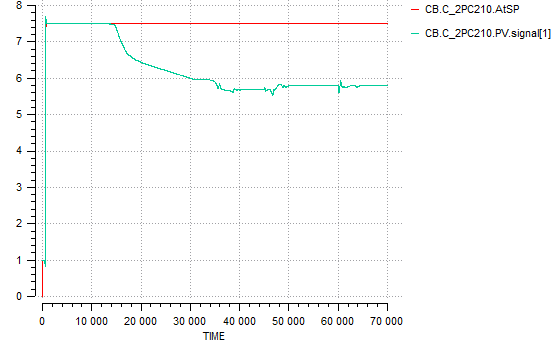 At the cold end, the temperature at the beginning is 300K and by the end of the cooldown it drops to 4.5K. The following plots show the speed regulation for each turbine (set-point and process value) and the regulation that is applied over the valve at the inlet of the first turbine.